About 15 years ago, when I was the Executive Director of a Community College Foundation, I attended the annual conference for the California Community College Foundations. At that time, most of us were offices of one (or part of one as many of us also had jobs within the college), and few of us were raising anything close to a significant amount of money. Planned giving hadn’t been on our radar, but a few of us were starting to push that agenda. Accordingly, the director of planned giving at a mid-sized university was invited to speak. She started by noting how important it was for us to get our “planned giving team” together weekly for a strategy meeting. She looked confused. We explained: for the most part, we were the team. The team of it all. We were all the foundation had. This is not an unusual scenario. While the vast majority—over 80%–of all public charities are very small, most of the advice, training, articles on fundraising come from the perspective of people who seem to believe that everyone has a robust development department. Most consultants consult as if there is actually a backbench to support the person they are talking with. But mostly, that is untrue. Over my 11 years as a consultant, my clients have mirrored the sector. Mainly they are small. Mostly they are under-resourced. Typically, they are, mirroring my blog name, too busy to fundraise. And yet, fundraise they must. I pride myself on working with these organizations by first meeting them where they are. And then helping them to figure out the best ways to raise the most money they possibly can. That means that the plans we devise are specific to them. The trainings I offer are heavy with specific tips on what they can do right now. It starts by knowing what is making you too busy to fundraise. And then figuring out how to change that dynamic. Special events and grants are often the villain. Considering the amount of money (not so much) that is raised—and especially how much is raised for the all-important general or operating fund (way too little)—they are terrible ways to spend your precious hours. But if you must, focus only on that which actually raises money. When I was a one-person office, I left the logistics of the actual event—the food, the decorations, the a/v equipment—to the catering department of whatever venue we were using. I hoped my board would sell the seats and tables. If I was forced (by the board) to have a silent auction, I gave them a choice—they could form a subcommittee that would be 100% responsible for the silent auction, or I would hire a company that did silent auctions for charities. I focused on sponsorships and I made sure that sponsorships were not cheap. The benefits were all about public relations. They could have a table, but unless they were willing to fill that table with senior executives and their friends, I would fill those tables for them. I had been to too many galas where the most centrally located tables were either completely empty or filled with low-level staff who often drank themselves silly and created havoc at the event. My second job was follow-up. Every board member was tasked with making sure we knew who was sitting in every seat and how we could get in touch with them. Certainly not everyone turned into a regular donor, but some did and a few made the effort more than worthwhile. Likewise with grants. For starters, relationships matter there as much as they do with individual fundraising. So most of my grant time was spent getting to know program officers at the various foundations and finding out what really mattered to them. I did spend a lot of upfront time creating an internal case statement, which had everything I ever needed to know about my organization. I also built two reporting templates—one for the end of the grant and one for interim reports. For renewal grants, I allowed myself no more than 4 hours to gather and pull together the information. They were renewals, for heaven’s sake. I did not need to reinvent the wheel every single time. New grants often took more time, but often I could repurpose information from other grants. I kept a tight lid on time there also, often dictated by (a) the amount requested and (b) the length the proposal needed to be. Needless to say, government grants took a whole lot longer than proposals to private foundations. There are so many ways to move yourself from “mired to inspired.” It takes effort, but it is effort that is so worthwhile. Still waiting for that magic bullet? That one thing that you’ll do that will bring in all the money? That special thing that is keeping you from doing actual fundraising because, well, you know, you need so much more right now than anything you could be doing to get your fundraising plan started? And oh yeah. That plan? The one you haven’t had time to work on because, well, things are really sloooow on the funding front and you need to raise money. I wish I could say, “Ha! I’m just being sarcastic and gnarly here.” But I’m not. I hear this sort of stuff all the time. I get calls from organizations who need to raise money yesterday, but can’t quite commit to hiring me, because what I do won’t solve the immediate problem. What I do will help them to build a comprehensive, robust and more than sustainable source of funding. But will take time. And it will take effort. I hear it from clients who have hired me, and don’t have the time to meet because—you know—they are in a financial crisis. Which I don’t understand at all. Because isn’t this why you hired me? Wasn’t the plan to well, plan so this didn’t keep happening? Wasn’t the idea to actually, finally, get down to the hard work of raising funds? And what are you doing instead? That’s a real question. You are too busy to meet with me, so you must be doing something—but somehow that never, ever, translate into stopping your financial hiccup. Here’s a truth: Fundraising is very hard work. It takes time and it takes structure. It would be lovely if it were simply an art, but honestly, it is a science. And like the scientific method, it means taking steps in a particular order, and understanding that, often, you will have to do a step you’ve done again and again. It’s linear but there are sidebars along with the retreats. Done consistently, with a plan of action that is pre-thought out (and written out). And honestly, if you do it that way, you will—I promise—raise money. Keep doing it and over time, you will raise enough to run your programs, pay your staff and raise even more money. Janet Levine works with nonprofits, helping to move them from mired to inspired. Let Janet help you and your nonprofit be Never Too Busy To Fundraise. Our other dog, on the other hand, blithely goes in and out of the doggie doors (we have two—one upstairs to the balcony and garage roof, where she can survey her entire kingdom!—and the outdoor one to the backyard). She is much more free than he is. Letting our fear control our actions is almost always debilitating and very limiting. It keeps you stuck where you are instead of looking to grow. Grow doesn’t always have to mean getting bigger. It can and often does mean enhancing something, making it better. In fundraising we should always be looking at how well what we are doing is doing, and whether we need to make changes. In one of my online classes, students often tell me about events or appeals that have been going on for years without assessment and which they believe don’t utilize their time well. In a recent class, a student posted several times about a 25-year-old golf tournament that took her staff most of 8 weeks to produce and manage, but only brought it a small cadre of golfers who were friends of the ED and were not donors in any other way. Does this seem like a good use of their time? But fear of upsetting the ED and looking to do something different (or doing the same thing differently) has held the development team back. In my trainings, I often get told how awful boards are, or clients bemoan non-functional staff. What holds them back from making needed changes is almost always fear. How do you get over that? Consider what the situation could look like—a golf tournament where players were also donors or where there was no golf tournament and staff had time to focus on more profitable ways to raise funds. Boards who were effective and worked with you to make your organization stronger. Staff who actually did what they needed to do, freeing you from aggregation. Then think about what it will take to get there. I’ll argue that mainly it will take education, and educating people often takes time. It is that time that often defeats us. We want the change now, but that is unrealistic. One of my clients spent much of his first year on the job assessing the effectiveness of his staff. While board members were pushing him to make changes, he very diplomatically educated them on what he was doing and why. He also tried to educate staff on what the new expectations were, and what they needed to do to gain his support. After his first year, several key positions have new occupants, while the former occupants were released into the workforce. As a result, the organization is stronger and working more effectively. And the board, seeing the good that has occurred is more supportive and more engaged. They have also been put gently on notice—they, too, are being evaluated and should they not perform, they too will be freed to find a different board on which to serve. None of this is easy. But as I look at my dogs, Minnie going in and out as she pleases, Tramp dependent on my good mood and my presence to let him in or out, and I know who I’d rather be. Janet Levine works to move nonprofits from mired to inspired. Learn more at http://Janet Levine Consulting.com. Sign up for the news letter and contact Janet for a free, 30-minute phone or zoom consultation. I know that feeling. For too long, I worked at too many places where I was expected to simply make do; where my staff was not held accountable. It’s a big reason my consulting practice is a practice—just me—instead of a firm—with employees. The obvious answer, of course, is to hire better, but I’m not sure that is even possible. Over the years of my pretty-long career, I have become convinced that fully 50% of everyone you hire turns out not to be who you thought he or she was. Sometimes that’s good—someone for whom you have low expectation turns out to be terrific. Often it is beyond bad. I remember hiring an adorable (can I still say that?) customer service associate with a great sense of humor who seemed to be very empathetic and a good listener, only to find that the person who actually showed up to work turned out to be a curmudgeon, with a capital C. And that was just one of many cases where I am convinced that I hired one person and the evil twin turned up. None of this, of course, means you throw up your hands and leave your staff to their own devices. It does mean that you have to be better at creating clear expectations for your staff, providing those expectations before you hire, and then have ways to evaluate whether they are meeting those expectations. And oh, evaluations have to happen way more often that once a year just because that is what is required. If you already have staff on board, there is no reason you cannot wind back the clock a bit and have those conversations about expectations and institute regular reviews. OK, if you work for a state or other government institution, you may have check first with HR, but if you do this across the board with every single person on your team, there should be no real problem. Begin with having clarity about what you want this person to achieve over the next year. When I was interviewing for jobs, the one question I would ask would be: If I was to come to work with you, what will I have accomplished in my first year that will make you feel you made a great hire? The answer or answers told me worlds about the organization, the department, whether I wanted the job or not (and sometimes made me wonder why I had accepted the offer when all those red flags were flying). What do you expect this person to do? Specifically. Not “identify, cultivate…” but rather, “Identify two new major donor prospects a month.” And do define what “New” means: New to the organization, to the major gift program, to this round of cultivations? 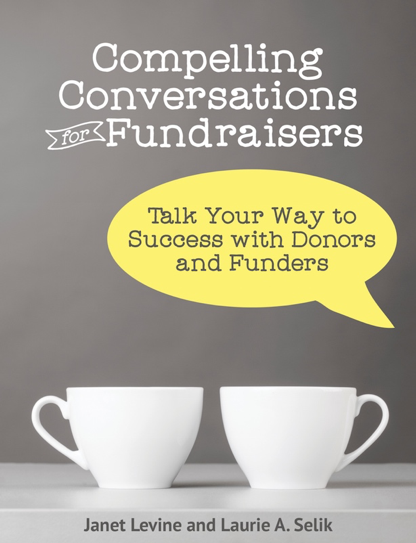 If you expect them to cultivate donors, how many face to face meetings each month does that translate to? What do they need to have after those meetings (hint: A solid call report; action items for next steps). How are they reporting this to you? And how often are you evaluating what they are doing? Having a great team is a lot more than luck. It is having a roadmap for the team as a whole and each member individually. It is ensuring that each staff person understands his or her roles and responsibilities and that you are constantly working with them to celebrate what is going well and to correct what is not. If you do this, you will have a great team. And you will accomplish all those goals your boss has set for you. Years ago, when I was making a living (kind of) as a freelance writer, I would send out manuscripts with visions of how it would feel when my pieces were published. That happened sometimes, but mainly it did not. Not, mind you, because my work was rejected. Oh, that also happened, sometimes. Mainly what happened was…..nothing. A great big silence that did not crack no matter how hard I followed up. That silence eventually defeated me, but then, for reasons still unclear to me, I decided to go into sales. Mostly there I heard a resounding “no!” But even that was preferable to being left hanging on the cliff. And then I fell (as most of us do) into fundraising. And that great silence returned. Let me talk to my spouse, partner, boss and I’ll get back to you. No, you will not. Though I admit to ridiculous bouts of optimism. Let me check my calendar. I’ll email some dates. No, you won’t. See above! Voicemail, which would never be responded to. Emails that seemed never to have been read. Ditto with texts. I could handle the rejection. The silence, not so much. Consulting turned out to be eerily familiar, except often, instead of me calling for an appointment, it would be a someone at a nonprofit reaching out to ask me for a proposal. Which I would send. And follow up on. And follow up on again and again and again. Arbitrarily, I set 4 months as a OK, they are clearly not going to do this now (or, perhaps, ever), and take them off my active list. About half the time, I was absolutely correct. But in at least 50% of the cases, many months, and sometimes years would pass and suddenly I’ll get a call: We are now ready to move forward. What I discovered was that mainly silence meant “I don’t know,” and the inability to make any kind of commitment, even one that is merely to respond to a call or an email or a text. I move those people to quarterly or bi-annual check ins, just so we don’t forget about each other. If I were still fundraising, I’d use those check-ins to tell my prospect about a recent success or a new initiative. I’d invite them to respond to learn more about that. Yes, yes, I know. That’s what newsletters are for. But let’s be honest here; most people don’t actually read your newsletter. Or do but promptly forget what they have read. And besides, if they did read it and found it interesting, they will be even more responsive to your outreach. Silence can be deafening. Don’t respond by loudly being silent yourself. Janet Levine works with nonprofits, moving them from mired to inspired. See how she can help you get the responses you want at http://janetlevineconsulting.com. While there, sign up for the newletter and do contact Janet for a free, 30-minute phone or zoom consultation. endowment, special events, to name a few. It’s not that I am against any of these, but I am adverse to anyone thinking they are necessary because, well, it’s what one does/needs. And sometimes—maybe oftentimes—it is not so much the what that worries me, but the how, the way these things are carried out. Take feasibility studies. Are they really necessary? Well, if you are going to build or seriously renovate a building, it would be good to test the waters and see if the money can, indeed, be raised. But too often I’ve seen how consultants assign the actual interviews to the greenest, lowest level consultants on staff, and watch opportunities to really assist the nonprofit in their fundraising efforts, never be broached. I also worry about the emphasis on reaching a dollar amount for the campaign—without much thought about how it will impact ongoing fundraising. Yes, comprehensive campaigns say they deal with this by including annual giving as part of the campaign, but I am not always convinced. This is not to say I’m against comprehensive campaigns. For some campaigns, for some organizations, it is definitely the right way to go. But just because it is “the way we do campaigns now” it doesn’t follow that it is best in every situation. Indeed, for some, separating a capital campaign from ongoing fundraising is far wiser and more effective. Strategic planning is another one of those things that I absolutely, unequivocally think organizations need to do. But again, the how is what is really important. And the how influences the what—the what you end up with and whether it is useful or just a document that sits on the desk. No matter what you are doing, the first step is to ask yourself why—why you are doing this and what you hope you will get out of the exercise. Working backward, consider what you need to figure out in order to get where you want to go. to arrange for a free, 30-minute consultation.